Wladimir Klitschko will knock out Tyson Fury when they fight in Dusseldorf on Saturday, says British heavyweight prospect Anthony Joshua. Ukrainian Klitschko, 39, has been a world heavyweight champion since 2006, engaged in 27 world title fights and made 23 successful title defences. He will be defending his WBA, IBF and WBO belts against Britain's Fury. "How great would it be if Fury won? But I'm picking Klitschko, in round five or six," Joshua told BBC Sport. "Fury will come out fighting, the adrenalin will get to him, take over his body. "He throws a lot of punches and moves a lot for a big guy but Klitschko has got so much experience, he's been defending his heavyweight title for 10 years. And it only takes one shot." Olympic champion Joshua, 26, has won all 14 of his professional fights by knockout and is yet to be taken past the third round. He is a potential future opponent for both Klitschko and Fury but his next fight is against Dillian Whyte for the vacant British title on 12 December. While Joshua said he would like to see Fury wrest the titles from Klitschko, he also had some words of advice for his compatriot. Fury, a devout Christian, recently compared homosexuality to paedophilia and accused Klitschko of being a "devil-worshipper". "I think he should start reading some books and educate himself a bit more," said Joshua, who knocked out Scotland's Gary Cornish in September to win the Commonwealth title. "And stick to boxing, that's what you're here to do. He's a good fighter, he's got the world at his feet. He's told us time and time again that he's the champ, now he needs to go out there and prove what he's really about. "If you want someone to look up to, look up to Wladimir Klitschko. Being heavyweight champion of the world comes with celebrity and glamour. But he's managed to maintain his discipline and take care of his belts for almost 10 years. That's incredible. "Without the Klitschkos (Wladimir's older brother, Vitali, is a former heavyweight world champion), who else has there been? Without them, the belts would have been here, there and everywhere. "Every one of Klitschko's opponents says the same thing about him, that he's boring for the sport, killing the heavyweight division. Then they get beat. "If Tyson Fury is fed up of Klitschko, go out there and beat the guy. Enough of the talking, let's see some action." Listen to the Klitschko v Fury world title fight live on BBC Radio 5 live from 21:30 GMT on Saturday, 28 November. There will also be live text commentary on the BBC Sport website. Is Klitschko really bad for boxing? Read more on Klitschko v Fury: Has Wladimir really killed heavyweight boxing? 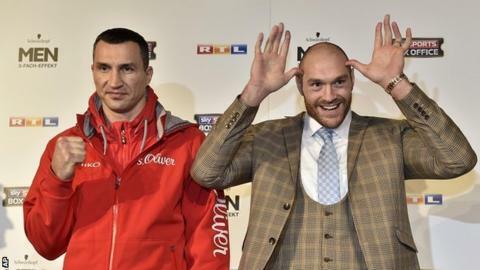 Tyson Fury: Superhero or Joker?